Here Lee talks about how 'New You' can use Key Six of Mark Womack's Six Keys of Disciplined Execution to guarantee the weight loss you desire. Lee also includes his theory of BEHAVE; to have you must be. Lee mentions his 2015 white paper which you can get for free at our homepage. If you want to lose weight then the 6th key of disciplined execution from the business improvement programme with the same name will help you do it faster than ANY other method available anywhere. Start by knowing precisely what weight you want to be; create a vision of how you will look physically when you are that weight. Hold onto the image of this 'new you' and get familiar with it so that it's never a problem 'calling' it up any time you choose. Determine exactly how 'new you' thinks and her/his attitudes towards anything related to weight. What are 'new you's' thoughts about food and water intake and exercise? What are 'new you's' behaviours about food and water intake and exercise? How is 'new you' disciplined? How does 'new you' respond to temptation? What time does 'new you' get up / go to bed? Next, start behaving as if you are 'new you'. What happens next is amazing. Time passes and you continue asking and answering the questions about how 'new you' would act and so long as you are honest with the answers and disciplined with the 'behaving as if' part, you will find that you have transformed into your former vision of 'new you'. There is no simpler way. There s no way for it to fail. If you want to 'BE' that 'new you' and 'HAVE' the figure that 'new you' has then you must begin to 'BEHAVE' like 'new you' TODAY. You can only become the person you desire to be by thinking and behaving in the ways the person you desire to be will think and behave. Put another way, the person you desire to be thinks and behaves in certain ways in order to be that person. And you think and behave in the ways that make you the person you currently are. There is no alternative transition to becoming 'New You' other than to think things and do things that 'New You' thinks and does. Therefore thinking and doing these things as often as possible will HABITUALISE the behaviours in the least possible time. It's the fastest possible way to success. It's official! GoalBand - the weight loss wristband that helps weight watchers maintain high motivation level has been given a technological workout! 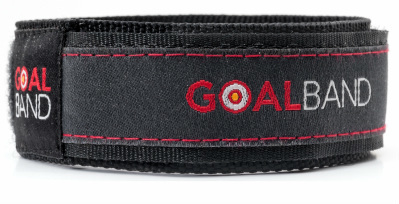 Now a quick scan from your Smartphone, your GoalBand will connect you through to the GoalBand facebook group; a new group only open to GoalBand wearers. This is where GoalBand wearers will hopefully share their goals, aspirations, triumphs and yes,,,their challenges. It's a place to share and find tips and tip-offs and an abundance of encouragement for those calorifically challenging days! As a weight loss motivational aid, Goalband really helps; it's your constant always on reminder of your goal, why you're doing this, why it matters! The new version of the band aims to give weight watchers the opportunity to connect with other who are dieting; sharing goals and success stories to help fire up and motivate other weight watching members the community. 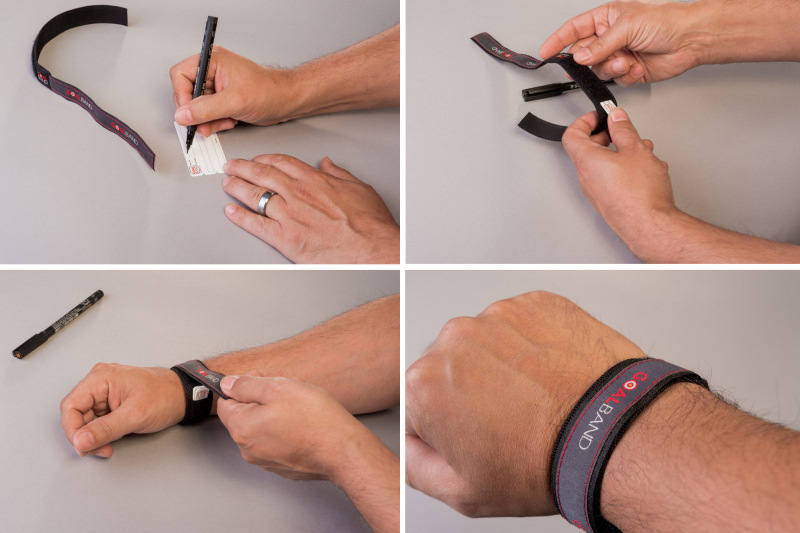 The band contains a chip that can be scanned with Smartphones. Scanning the band takes a users phone straight to the GoalBand Group on facebook. Smartphones need to have NFC enabled and 'open'. iPhone doesn't 'yet' work as Apple have locked it down. This may soon change. You can still get access to our GoalBand weight loss Facebook group even if your phone is not compatible so long as you own a GoalBand. What stops people achieving their goals? Here is a list of what we consider to be five top problems why people never seem to achieve their goals along with suggestions of how you can overcome them. Whilst the list is by no means exhaustive, master these five and you will be on your way to living the life you truly deserve. Most people do what everyone else is doing; they’re like sheep. They follow, copy and mimic others who appear to be doing what they want to do but who are in fact just following others. They conform by going to work in jobs that are making them sick, claiming they cannot wait until Friday. They would never risk giving it all up to pursue a dream; they have FAR too much to lose. They conform to the idea that they need to work to earn a living. They buy security but do not realise the real cost; they are literally trading their life for a mediocre existence. If you are not working full time on your own goals, you are working for someone else who is. Distraction is everywhere and will only increase. The device in the palm of your hand is distraction incarnate. Use it to distract. Sell or be sold. Accept distraction is ALWAYS trying to steer you away from your goals. Learn how to refocus again and again, and again. It’s necessary. Find your own way. Find a way to un-distract yourself from the 'noise' all around and ATTRACT yourself back to your goal. GoalBand wristband and the GoalBand Success System will help here. The law of diminishing intent states that the longer a person waits to take action on a specific objective, the less likely it will be that any action is taken at all. Take time to work on the idea; your vision and of course to plan it all out. But never leave the site of a goal without taking some kind of action towards its attainment. Know where you want to get to. Have it specifically laid out in your mind so you can visualise and describe it. If you don’t know where you going then you will not know when you get there. You don’t just hop on a train without a destination in mind or get in the car and drive. You have a firm idea of where it is you want to go. The same applies to life goals and feeling fulfilled. Many people struggle to see the vision; the destination because they do not feel worthy of the goal. That is BS. If you are willing to work for the goal then the goal is yours from the moment you first visualise and make your plans. Some weeks ago I decided that in order to achieve the specific goal of creating and writing the world's best selling food diary and weight loss journal before December 2014 I needed to find time to do it. Challenging with already running and being involved in three businesses. I already wake up at 04:25 and enjoy around 7-7.5 hours sleep per night to maintain my energy levels. I decided the only way to achieve my goal was by placing a taxation on my sleep and, I set my 'opportunity' clock for 03:15 for Monday AM. It's tough getting up at 03:15 !! I won't go into the detailed effects here but getting up at 3AM was challenging. It's no wonder they call 3AM the Devil's hour! However I made the decision to repeat this Monday to Wednesday each week, because on the first Thursday I had a seminar to attend and I wanted to be fully alert for the duration. I felt three days a week getting up at 3 was effort enough. I wanted to create the habit of getting up at this time and so continued the pattern for four weeks. By week three I was naturally waking at 02:45 'anticipating' the alarm. My former pattern would have me wake around 04:20, so I now consider the earlier start habit to be firmly embedded. Eat your favourite food too often and as the habit develops it no longer feels as good. Get up an hour earlier everyday to do a workout and as the habit develops the pain diminishes. Consistency of action is the key to developing any habit be it purposefully built or otherwise. Consistent early starts mean I appreciate sleep more than ever! Another example of where consistency of action leads to developing good habit relates to a journal that I began writing on 29th June. The journal is an idea that I took from a presentation given by Entrepreneur Magazine Editor Darren Hardy. Spend no more than 5 minutes a day making an entry to my secret journal. In order to create the habit I set an Outlook reminder that popped up I the morning at 7am prompting me to take action there and then. After 5 - 6 weeks I can say for certain that this became a deeply embedded habit; no sooner than I have sat down at my PC for the first time in the morning I immediately find myself reaching around the back for my 'secret journal'. I plan to give this to my wife on New Years Day 2015. Creating habits that lead you to your goal require some willpower only at the start, soon after they become second nature. You must however force frequency, meaning you cannot expect a habit to form if you only do that thing you want to when you feel like it. With both my examples of the early start and the secret journal there are times when I didn't feel like taking the necessary action. To miss a day would be to miss forever. Whilst these examples do not relate directly to weight loss the principles of building great habits for losing weight are identical. Follow this series to learn more about how the power of written goals and visualisation can help you to build your success habits and achieve dreams for yourself. Great Achievement GOALBAND Now On GOOGLE PLUS! Google plus fans are shouting loud together "Hoorah! Hoorah!" "Er,,,Google Plus fans,,, why are you cheering so loudly?" Google plus fans reply "Have not you heard? 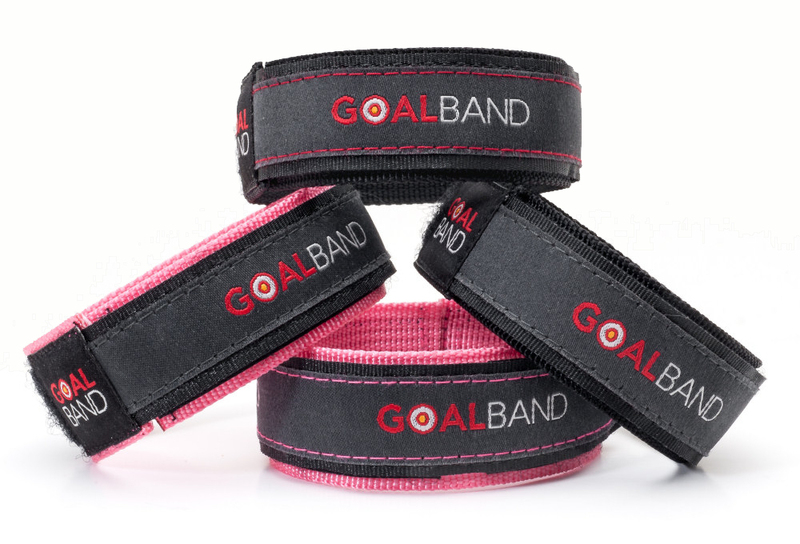 GoalBand can now be accessed on our favourite social media platform!" "And which social media platform is that Google Plus fans?" Google Plus fans incredulously reply "Why? Google Plus of course!" "Arr I see. Do you have the link to the area on google Plus where non-Google Plus fans can access GoalBand content on Google Plus?" Other Google Plus fans happy cheer "yaaay!" Weight loss is hard. That's not news. Nor is the fact that only 3 - 5% of slimmers succeed in achieving and maintaining their ideal or goal weight; a figure reported consistently by diet experts for well over a decade. Why do you think the success figure is so low? Weight loss is not like trying to grow hair after experiencing hair loss. Weight loss after all is controllable and hair growth isn't. The answer lies in the somewhat taboo area of personal habits. It may seem rather straight talking but a person who is not their goal weight (ideal or desired) is not in the habit of practicing the behaviours that are practiced by someone of their frame and height that is their goal weight. Unless of course medical reasons exist which removes their relevance here. Put simply, people's inability to achieve and maintain their goal weight is down to their beliefs, behaviours and habits. Scientists at Massachusetts Institute of Technology (MIT) discovered that the brain activity of lab rats that had been trained to perform a habitual routine actually totally flat-lined; once a habit formed they didn't think about 'doing it' - at all! For the full study read Charles Duhigg's: The Power of Habit. The part of the brain responsible for habit (the basal ganglia) seeks to create efficiency of any repeated behaviour where there is both a cue and a reward: I smell the delicious cookies (cue). I eat two without thinking (behaviour). I feel satisfied for a while (reward). In this case it's the behaviour - 'I eat two without thinking' - that's damaging for dieters as the unnecessary additional calories serve to increase weight. We have to remember that habits are always the result of a conscious choice that we once made to do something, that we then continued doing, until we did it without thinking. Permanent habit change comes through a process of identifying the elements of a habit; the cue, the behaviour and the reward. Sometimes this is really simple. If a person really desires lasting change and uses a system to help go about it, it's really straightforward. Sometimes people set themselves for certain failure by attempting to use willpower. You must have heard someone exclaim "Right that's it! I'm on a diet tomorrow." This approach is dangerous because without planning and a strategy it's destined for failure - as seen time after time. A new habit can be created in a very short amount of time - as little as 30 days by developing a system such as that used by the GoalBand Success System. Habit replacement is the surest, fastest and safest way to lose weight. As a method it goes for the jugular of unwanted weight gain, hovering around a pound or two off then back on and pandering around weight loss groups that don't really want you to be too successful at losing weight. What have beliefs got to do with habit change? We must accept that change is always possible. What's more it's necessary to believe that change is possible for you. It's also necessary to believe authentically that you can live your life with the new healthier eating habits (if weight loss is why you are reading); the habits of a person with your frame and height who enjoys carrying your ideal goal weight. We also have to believe that change it can be hard and accept that we are ready to face the challenge whilst holding a new vision of our new self. Using motivational goal implementation tools whilst new habits are formed and 'bed in' is crucial to success. How can goal setting help with habit change? Whenever we set a goal it is to achieve something that we currently do not have or are not experiencing in life. We don't yet have our goals because - to date - we have not been living our life with beliefs, behaviours and habits necessary to have acquired those things. Otherwise we'd already have them! Therefore setting and working towards a goal disturbs our behaviours (in a great and positive way) and shifts us onto new paths with fresh horizons. Underpinning GoalBand is an incredible resource; The GoalBand Success System is an outstanding, easy to use guide that walks you through, step-by-step, how to use your GoalBand to develop the beliefs, behaviours and habits necessary not only to reach your weight loss goal but to smash right through it. Lee: "This was filmed by award winning cameraman, Mark Oulson-Jenkins, at Raising the Roof Productions (RTR) in Burnley, UK. If your planning on filming for your website or blog etc. I can't recommend those guys highly enough. It was a goal of mine to get this down properly and RTR I feel helped by doing a great job. I'm not a natural presenter but I'm passionate about goals and everything in there is quantifiable information."